1. In a medium-large skillet, heat oil over medium heat. Meanwhile cut and prepare vegetables. 2. Once oil is heated, add asparagus, zucchini, leeks, spinach and garlic and sauté for about 8 minutes or until asparagus stalks become slightly tender. 3. 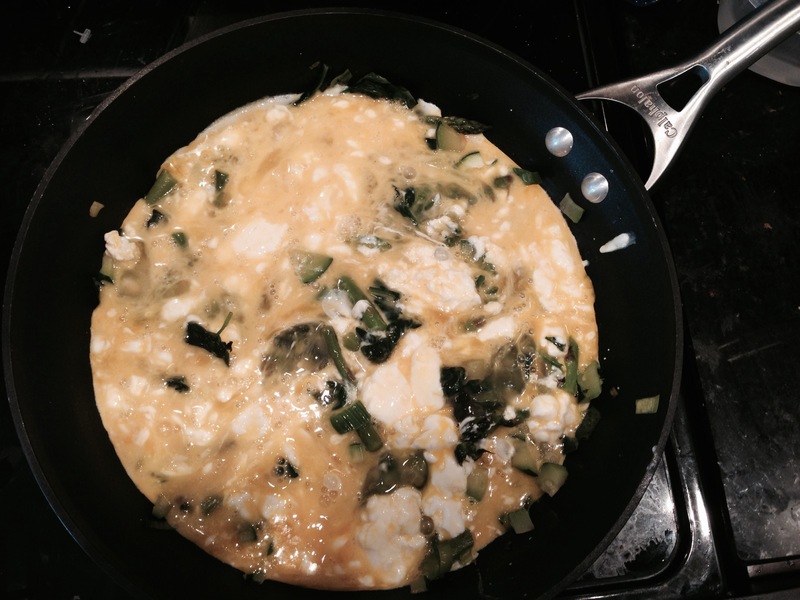 While veggies are cooking, whisk together eggs and goat cheese. Pour eggs on top of cooked vegetables and let sit for about 1 minute. Then begin to gently push eggs around with spatula until cooked all the way through. 4. Add smoked salmon once eggs are cooked and continue to heat for another 1-2 minutes. You may season with a small amount of salt and pepper or dill and chives. I sprinkled a little bit of remaining goat cheese on my dish.